Origin: North east Mexico and West-Texas. It is one of the most beautiful desert yucca's, with its nearly spherical heads, formed by numerous long blue-green to blue-grey leaves of 40-70 cm long and 1-1,3 cm wide. The inflorescence is about 11 cm and the panicle is about 60 cm long and usually towers above the leaves. It has fleshy bright white flowers. 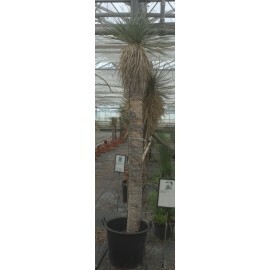 Yucca rostrata prefers growing on shallow slopes or ridges of limestone in limestone gravel. Like all yucca's they like full sun and well-drained soils. The plant will withstand temperatures down to -15°C, when rooted out properly. What you find here is only a small collection of our actual stock!